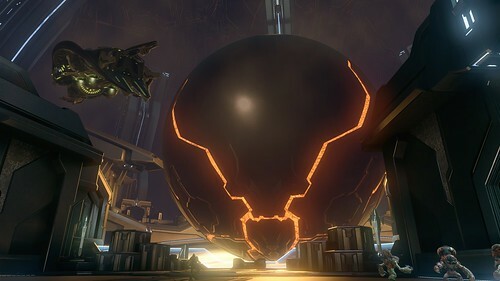 Whereas the first three installments of Halo feel like playing through a movie — with writing, voice acting, action, and art culminating in an immersive, interactive, exploratory experience, Halo 4 feels like a choose-you-own-adventure book that presents its reader with one option, and flipping that page (or pressing the A button in this case) equates to tedious battles muddled through solely for what they lead up to: the next cutscene. Not all is woe however. The story Halo 4 presents, between the aforementioned cutscenes as well as videos in Halo Waypoint unlocked via terminals found throughout the campaign, is an engrossing one that spans the course of human evolution and then some. The themes — the definition and drive of humanity, preservation versus destruction as saving grace, and of course the will to survive — are knit together very well and provide a background rife with tensions perfectly exploitable for an epic adventure. So why the feeling of disappointment? Gameplay-wise, there are no major differences between Bungie’s original trilogy and this current effort by 343 Industries. Gameplay-wise, there are no major differences between Bungie’s original trilogy and this current effort (purportedly the first installment of a trilogy) by 343 Industries. 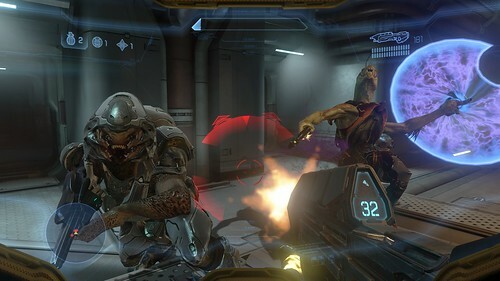 Both use the FPS formula to put players behind the visor in Master Chief’s helmet, present a challenge via confrontation in the form of an alien armada-to-super soldier ratio, and weave throughout their campaigns the love story between a curvy AI and a championed mutant and an underdog tale of humanity versus the universe. 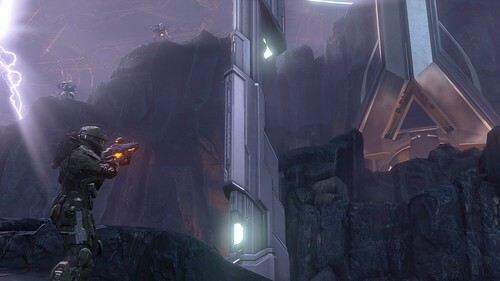 Hordes of foes, Covenant and Forerunner, will require, depending on the selected difficulty, at least some degree of tactical discipline to defeat. 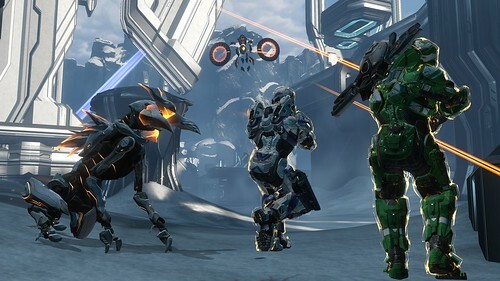 The more refreshing challenges, specifically regarding the Forerunner minions, come from movement. 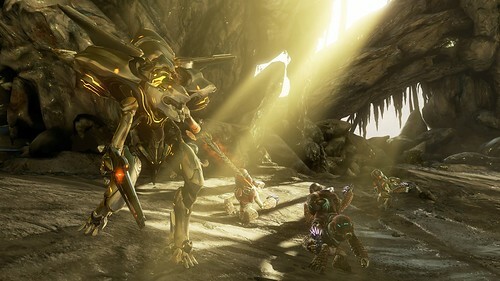 Whether it’s against the swift, pack-like behavior of Crawlers or the short-range teleportation tactics of Promethean Knights, the player is forced to adapt Master Chief’s human range and rate of motion to counter advanced life forms in the heat of battle. Halo 4 also ups the challenge ante by taking away dual-weapon wielding, which can be as frustratingly limiting as it is blissfully simple, and the bipedal surprise was also a fun addition. The races’ weapons are comparable, but the story misses in every cutscene the opportunity to make any sort of relevant point regarding the nature and means of violence. The foreign-yet-familiar nature of the Forerunner planet fosters an ingeniously misleading kinship betwixt similar life forms (humans and Forerunner) but ultimately ignores its own metaphor. The races’ weapons are comparable: for every pistol there’s a boltshot, for every shotgun there’s a scattershot, for every assault rifle there’s a suppressor, etc. — much in the same way Covenant weapons parallel those of the UNSC (with exceptions of the needler and energy sword). The implications of such a parallel in the actual gameplay, however, often mean nothing more to the player than a quick cognizance of the expected range of and degree of damage, while the story misses in every cutscene the opportunity to take advantage of such similarities to make any sort of relevant point regarding the nature and means of violence. This is the chink in the narrative’s relation to the gameplay, but what about the opposite? Playing Halo 4 consists of battling through a series of deployments (as with every other game in the original trilogy and FPSs in general) in order to get over there and do that. Problem is that “get over there” and “do that” sound almost exactly like the directions given Master Chief by Cortana (his true-blue AI companion, the voice in his head) at every turn. Every step of the battle, say, activating three pylons, is hand-fed to the player’s ear after each actuation. The game doesn’t lack for visual cuing, so this often redundant, uninspired, audio instruction feed just serves to remind the player that X objective is a step in a game rather than making it feel like something crucial players must vicariously carry out as Master Chief. That said, every step in battle feels furious, layered with imminent threats under a ticking clock ... at least on the first run through. Spartan Ops epitomizes Halo 4 by offering one long cutscene and five missions per story, each of which is a thinly veiled survival round meant purely for gaining points for upgrades. Various difficulty levels, co-op opportunities, and achievements make the Halo 4 campaign very replayable for completionists and competitors. Lending to extended playability for everyone, Spartan Ops provides a side story each week (four so far) centered around the efforts of other Spartans in events connected but inconsequential to the main campaign. To be honest, Spartan Ops epitomizes Halo 4 by offering one long cutscene and five missions per story, each of which is a thinly veiled survival round meant purely for gaining points for upgrading Spartan armor/weaponry/etc. and having a blast doing so (alone or with friends). While offered to supplement a disappointingly short campaign, Spartan Ops feels like chewing on the dry bones of a meal you watched someone else eat if you are looking for story-driving sustenance. Of course there’s also the Forge (map builder) and War Games (online multiplayer) to keep fantasy FPS addicts screaming into their headsets until the next Halo comes out. As the first in a supposed trilogy, Halo 4 tells an excellent story with enjoyable twists and a decently omnipresent question that weighs on the mind after the credits roll. While the stories framing the campaign and collected via the in-game terminals are important to each other, I’d say their separation from one another feels like a pacing issue that literally takes the player out of the game as much as playing the campaign does figuratively. 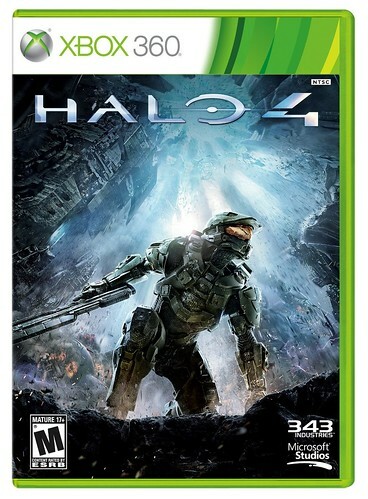 Halo 4 is still a fun and engaging FPS that has amped up the franchise's battle intensity to 11 with its combination of music, motion, and enemy ferocity. I’m looking forward to the continuation of this saga and its myriad possibilities in Halo 5 , but hope that game is crafted such that players can once again feel the overarching experience in the same manner the original trilogy managed to accomplish. This is essential to driving the success of a narrative-driven FPS such as Halo , especially if gameplay elements are going to remain essentially stagnant. Author’s note: I could listen to the music on the main menu forever (dig that French Horn)!